President Barack Obama says as he said, the sun would come up the day after the election. He also said he spoke with Trump and invited him to come to the White House. "The presidency and VP is bigger than person ... going to work as hard as we can on having" a successful transition. " We are now all rooting for his success"
Obama said he is proud of Clinton. "I am absolutely confident that she and former president Clinton will continue to do great work." I also told my team today to keep their head's up .. we are leaving the next president with a stronger, better country that it was 8 years ago." "This is a long and hard fought campaign ... but that's the nature of democracy ... but to the young people, who got into politics for the first time and may be disappointed by the results, I want you to know you have to stay encouraged. Don't get cynical or think you can't make a difference. As Sec. Clinton said today, fighting for what's right is always worth it. I'm confident that this incredible journey we are on as Americans will go on and looking forward to making sure that the next president is successful ... you take the baton, you run your best race and hopefully by the time you hand it off you've made progress. I want to make sure that hand off is well executed because we're all in this together." Hillary Clinton: "This is not the outcome we wanted or worked so hard for and I'm sorry we did not win this election for the values we share and vision we hold for our country. You represent the best of America; being your candidate has been one of the greatest honors of my life." "I know how disappointed you feel because I feel it too ... this is painful and it will be for a long time but I want you to remember this: Our campaign was never about one person or one election. It was about the country we love and building an America that's inclusive and big-hearted. I still believe in America, always will, and if you do, you must accept this result and look to the future. "Donald Trump is going to be our president. We owe him an open mind and a chance to lead ... a peaceful transfer of power." "Let's do all we can to advancing the causes we hold dear.. "
"We spent a year and half bringing together millions of people ... the American dream is big enough for everyone." "To Barack and Michelle Obama, our country owes you an enormous debt of gratitude. We thank you for your graceful, determined leadership ... and to Bill, Chelsea ..our entire family, my love for you is more than I can express." "I will always be grateful to the creative, talented dedicated men and women at our HQ in Brooklyn and all across the country." 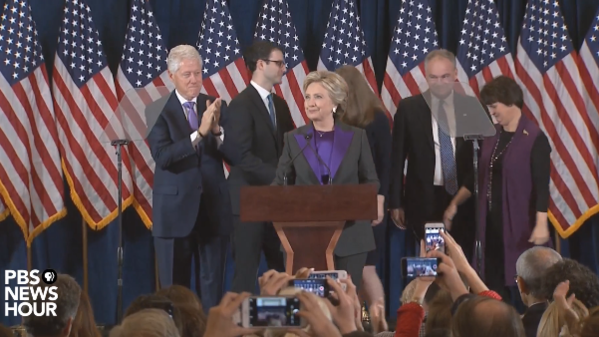 "To all the women who put their faith in this campaign and me, nothing has made me prouder than to be your champion," a teary-eyed Clinton said. "And to all the little girls who are watching this, never doubt that you are valuable and powerful and deserving of every chance in the world to pursue your own dreams." I count my blessing every day that I am American and still believe that if we stand together with respect for our differences, strength in our convictions ... our best days are still ahead of us." "Let us not grow weary, not lose heart... There are more seasons to come and more work to do. God Bless You and God Bless America." 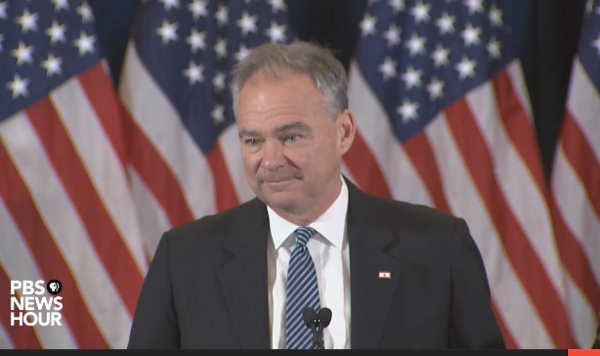 Kaine, speaking before Clinton, said: "I'm excited and proud of Hillary Clinton because she has built such a wonderful team." He also praised her for winning the popular vote. "I'm proud of Hillary because she loves this country." "They kilt us but they ain't "whupped us yit," he said, quoting Faulkner, on the loss. Trump said Clinton called him to congratulate and concede. "She fought very hard ... we owe her a major debt of gratitude for her service to our country." "Now its time for America to bind the bounds of division .. it is time for us to come together as one united people." "I pledge to every citizen of our lands that I will be the president for the American people. For those who have chosen not to support me in the past, for which there were a few people, I'm reaching out to you for your guidance and your help so we can work together and unify our great country." "Ours was not a campaign but an incredible and great movement made up of millions of hardworking American men and women who worked together to make America better for their family. It is a movement combined of all races, religions, backgrounds and beliefs who want and expect to serve the American people and serve the people it will." "Working together we will begin the urgent task of rebuilding our nation." "Every single American will have the opportunity to realize his or her full attention. the forgotten men and women will be forgotten no longer ... we have to rebuild our infrastructure, which will become second to none. We will put millions of our people to work as we rebuild it. We will also finally take care of our great veterans. "I will harness the greater talents of our people and we will call on the best and brightest to leverage their talents for the benefit of all ... we will double our growth and have the strongest economy..."
"We will get along with countries that want to get along with us ... America will no longer settle for anything less than our best .. We must reclaim our country's destiny and dream big and bold and daring ... we are going to dream of things for our country. While we will always put America's interests first, we will deal fairly with everbody. We will seek common ground and not hostility." "I want to thank my parents who I know are looking down on me right now .. I had truly great parents." He also went on to thank his siblings, his wife, Melania, and his children. "I love you and I thank you and especially for putting up with all those hours. This was tough. This political stuff is nasty and it's tough." Trump also gave a shout out to former NYC mayor Rudy Giuliani and his former rival in the race for the GOP nomination Ben Carson. "We're going to get right to work ... you're going to be proud ... I love this country .. and thank you to Mike Pence."